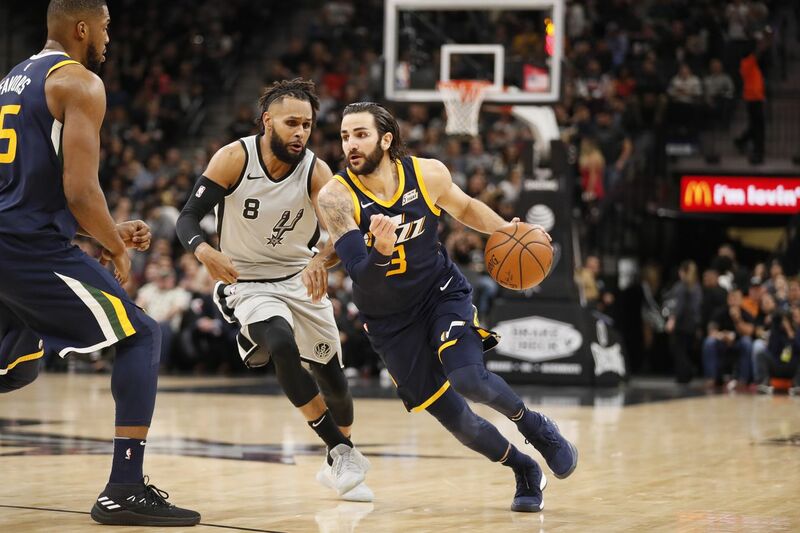 Ricky Rubio’s career night led to a second straight home loss for San Antonio, as the team heads into its annual Rodeo Road Trip still searching for an identity. Sometimes it’s just one thing that throws an entire performance out of rhythm. In the Spurs’ 120-111 loss to the Utah Jazz, point guard Ricky Rubio was a singular force, consistently breaking the defense down off the dribble, hitting from both mid- and long-range, and finding open three-point shooters with pin-point skip passes as the San Antonio defense scrambled with great effort but questionable purpose. Rubio didn’t miss his first nine field-goal attempts and finished with a career-high 34 points, nine assists and a game-best plus-15 on the night. 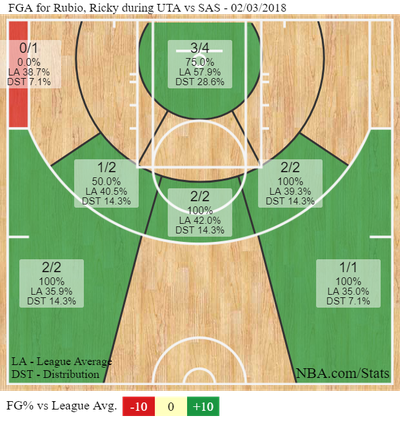 In reconciling the loss, you could look at the shot chart below for a player averaging just over 40% from the field this season and simply shrug it off as one of those once-in-a-blue-moon nights. Doing so, however, would ignore the fact that Rubio has been red-hot amid Utah’s five-game winning streak — a fact that matters, even if Gregg Popovich reiterated once again before the game that he does not keep up with what opposing teams or players are doing. More importantly, it’s rarely just one issue that defines a win or a loss, and the Spurs’ struggles in this poor stretch of games have come with a handful of recurring themes beyond one player’s performance. As in the loss against Philly, the Spurs coach took no questions after the game, briefly lauding his opponent’s execution, physicality and effort before saying goodbye and leaving a roomful of reporters with a touch of deja vu. The Spurs also found themselves in familiar territory, falling behind in the first quarter and playing catch-up the rest of the way. They tried a few things to do contain the Spanish point guard, giving him different looks in the pick and roll and trying to get the ball out of his hands. The result, however, was often the same. Spurs fans (some of them, anyway) have learned to live with Mills struggling in the pick and roll. What they’re less used to is the defensive struggles that the team has experienced over its five-game homestand. In those games, three of which have been losses, San Antonio has given up 113 points per 100 possessions, a defensive rating which would rank dead last in the league. On Saturday, Rubio and other Jazz ball-handlers found themselves consistently going downhill, into the teeth of the San Antonio defense and, as Ginobili pointed out, that’s a recipe for trouble. Ginobili knows it’s not an ideal place to be, but little about 2017-18 has been ideal up until now. After all, sitting at the end of the team’s bench is a sullen, cornrowed reminder of this season’s injustices, a player who could allay many of the team’s troubles. Don’t expect the Spurs to pin them on Kawhi Leonard’s hobbled quad, just as they won’t hang Saturday’s loss on Rubio’s hot hand. All they can do is try to learn from it, and move on. We found shortly before the game that Davis Bertans would get another start in place of Pau Gasol. While his presence helped stretch the floor against Utah’s more conventional two-big frontcourt, it wasn’t a boon on the scoreboard, as the Spurs never recovered from the early deficit they surrendered in the first quarter. For Utah, the win is all the more noteworthy given their 5:30 am arrival in San Antonio and that they were without their best offensive player in rookie Donovan Mitchell, who was a late scratch due to the flu.